Calibration is an essential activity in power plants and there are various reasons to establish a proper calibration process. Improving power plant efficiency is one obvious reason in order to ensure profitability, while proper calibration is also vitally important for safety. Furthermore, properly calibrated emission monitoring equipment is essential in regulated areas. Various national and international regulations and standards require certain calibrations to be performed. Naturally, the reasons may vary in different types of power plants. This article takes a brief look into the most common reasons to implement a modern calibration process in power plants, explores the typical issues of an outdated calibration process, and concludes with a short discussion of a modern calibration process and how to implement it. Power plants have been proven to run more effectively and produce more energy and higher profits if the critical process measurements are more accurate. Regardless of how advanced the control system is, the system is only as good as the quality of the measurement data provided by the process control instrumentation. Inaccurate measurement data may cause the control system to make adjustments elsewhere in the process, causing additional strain on the assets and directly impacting their lifecycle and maintenance costs. Source fuel is the largest operating cost for a power generation unit, and plants which have performance or heat rate improvement programmes perform better than those that do not. Many of the initiatives identified to achieve the largest improvements are also capital intensive, requiring considerable time and resources. Addressing instrument calibration can be a much lower cost initiative, but can still contribute to improved performance and heat rate. In order to keep the process measurements accurate, a proper calibration process needs to be established. Calibration should be performed with high quality equipment that ensures proper accuracy and uncertainty. Likewise, the plant should utilise calibration management software to provide the highest level of traceability. The calibration process itself, commonly referred to as standard operating procedures (SOP), must be well planned to help ensure that the work is performed effectively. Using calibration management software to analyse data and perform history trend analyses helps with instrument prioritisation and ensures the usually limited resources are used for the most important calibrations. So efficacy in this context means being able to run the power plant in a more effective manner in order to produce more energy and earn higher profits. But efficacy also means that the calibration SOPs create the best outcome from normally limited available resources. Plant safety is an essential matter for power plants for many obvious reasons. Apart from regulatory requirements, safety is a very high, if not the most important, priority for any plant. The power plant environment is a collection of systems to carry fuel, combustion air, and boiler water. In addition to the high-pressure steam hazards there are a variety of other conventional and chemical/physical hazards that must be controlled. Operating a high pressure boiler-turbine combination involves a rigorous set of controls to ensure safe operation to prevent the boiler from exceeding pressure limits. Safely managing these risks requires critically accurate pressure and temperature measurement. Depending on the plant type, there are a number of critical safety measurement points, which most often have redundant measurement circuits. As such, the number of critical safety measurement circuits to calibrate can be very high. Since the calibration of these critical safety circuits is controlled by regulations, it is best to ensure that these are calibrated at suitable intervals with proper uncertainty and also ensure that the calibrations are documented and reported in an appropriate way. Failing to do these regulated safety calibrations may in the worst case entail the plant to be fined or even shut down by authorities, or cause a harmful accident. One of the major sources of injury for electric power generation is caused by falls from ladders, scaffolds or other elevated platforms. Job safety involves the interrelationship between people and work; materials, equipment and machinery; and the environment. At the same time, for economic reasons, the highest possible level of productivity must be achieved. An accident prevention strategy with regard to calibration work must focus on reducing the tools required to perform the work and minimise the number of steps involved. 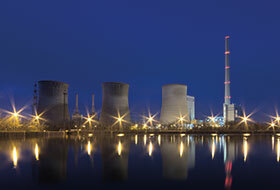 There are regulations for continuous emissions monitoring systems in power plants. Depending on the plant type there may be a series of gas analysers which monitor the flue gas for example for; sulphur dioxide, nitrogen oxides, carbon monoxide, carbon dioxide, hydrogen chloride, airborne particles and organic compounds, just to mention a few. In addition to the continuous measurement of these emissions, the measurements must also be calibrated properly. If the power plant fails to perform these measurements or calibrations it may be shut down and/or heavily fined. Although the actual fiscal metering and custody transfer is most often related to the oil and gas industries, power plants also have measurements that are used as the basis for invoicing or money transfers. It is obvious that if a large amount of invoicing is based on certain measurements, the accuracy of is of utmost importance. Any error directly affects the invoiced amount. Hence significant effort must be made to ensure that these measurements are as accurate as possible. The previous sections discuss some of the most critical calibrations in a power plant, but of course there are many plant measurements which require calibration. These may not need to be calibrated so often and the uncertainty requirements are not so critical. Even the documentation requirements of these calibrations may not be so stringent. However, they could have a significant effect on power plant performance and safety over time. 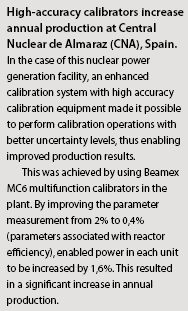 In an ideal world, power plants would have enough dedicated skilled metrology experts who could concentrate solely on performing calibration work. However, the reality is that most of us are not living in this ideal world. One common challenge that can be seen in many power plants today, as well as in many other process plants, is the lack of experts who have deep subject matter expertise in calibration-related metrology. Also, typically there are only limited resources that can be deployed for calibration work during an outage as there is a long list of other tasks that the same workforce is required to perform. Calibration is just a small part of their overall responsibilities. As such, it is important to use a modern automated calibration solution that helps make calibration work more effective in order to perform the calibrations faster and with fewer resources. Furthermore, the automated calibration solution should guide the workforce, through the calibration work in the correct way. This can include intelligent calibration equipment that executes fully automatic calibrations according to specified procedures with guidance on how to complete the calibration including how to connect to the instruments, the points to calibrate and the Pass/Fail calculations. Even in modern power plants, the calibration process may be outdated and based on manual or home-grown management tools. After upgrading a plant to modern, high-accuracy process instrumentation, legacy calibration equipment could be outdated because it fails to provide acceptable Test Uncertainty Ratios (TUR). Additionally, all documentation may rely on manually recording results using paper-based records. In these environments the entire calibration system may feel like a burden and inhibit real performance improvement. Calibration programmes based on heavily manual processes normally utilise paper-based forms for the procedures that guide the technician through the calibration. The calibration is often performed with non-documenting calibrators, so the calibration documentation is hand-written on paper, causing more work and the potential for typing errors. Also, error calculation for each test point is a manual process when determining Pass/Fail status. Results may be typed into an electronic database, if one exists, and the confirmation that the work has been performed is also manually entered into a computerised maintenance management system (CMMS). So in short, an outdated legacy calibration process can be labour intensive, may result is poor calibration accuracy, generates unnecessary paperwork and may be prone to errors related to manual data entry. Due to the lack of calibration resources, calibration is outsourced just as often as it is in-sourced. When service providers perform the calibrations, the process needs to be very well planned and specified, so that the plant can be sure the service provider calibrates exactly as required. The calibrations need to be compliant and well aligned with the company’s internal SOPs. The process needs to follow regulations and be optimised, so that no time is wasted during shut downs and schedules are met. Plants should always strive to reduce and shorten the shutdown period with an effective calibration process. When calibration is out-sourced to a service provider there is always a risk. If calibrations are done on paper, manual data entry involves a significant risk of errors. Having calibration software in place where the data is automatically stored makes the data easily accessible and the oversight remains within the plant and not with the service provider. Documenting the calibrations makes the data not only dependable but also traceable for inspections and/or audits. What is a modern calibration process like? If we look at the most modern calibration processes available today, we can find the following key components: the management, monitoring and scheduling of all calibrations is automated with the help of dedicated calibration management software. The calibration management software can be linked to the CMMS for a fully automated and paperless flow of work orders. The calibration management software also communicates with portable documenting process calibrators, meaning that the work orders can be downloaded directly into the calibrators with all the required instructions for the technicians to go into the field. During calibration, an intelligent calibrator performs an automatic Pass/Fail calculation, complicated calculations do not have to be performed. Also, the results will be stored in the calibrator’s memory, and can be directly uploaded to the calibration management software. Finally, the calibration management software can automatically send an update to the maintenance management software that the work has been completed. As such, the whole process is fully paperless and more can be done with fewer resources as the process is highly automated, thus reducing costs and improving the quality of calibration data. A modern calibration process is also far more efficient, allowing more calibrations to be performed in the limited time during an outage. Why and how to implement a new calibration process? The most important reasons to implement a modern calibration process are to improve calibration efficiency, save costs, obtain higher quality calibrations and be compliant with related regulations. But how can a new calibration process be implemented? Briefly, here are a few words on implementing a new calibration process: it is vital to remember that implementing a new calibration process is a process itself, with many interrelated tasks that need to be performed in the appropriate sequence. A proven project supply implementation model is recommended, managed by a dedicated project manager and supported by experts in the subject matter. Without a proven implementation model, typical risks of implementing a new process are usually encountered, such as unclear expectations, budget and schedule overruns, scope creep, and a lack of expected benefits. Although implementing a new calibration process is far smaller in scope than implementing, for example, a new ERP system, there are still many similarities. The implementation should start with establishing the project framework in order to have a common understanding of the project targets, specify the roles of the parties in the project team and steering group, establish management rules, determine testing and acceptance criteria. During specification, you will need to document all the relevant requirements and make sure all parties have a common understanding. If all previous steps have been performed correctly, the next phase is the actual execution according to plans. Finally, the new process is put to use with secure support when in production use. Using a supplier that has a proven implementation model for the required actions is recommended. • Improve the plant performance and efficiency. • Improve the accuracy of invoicing and related measurements. • Make the calibration work more effective, automated and paperless. • Save calibration related efforts and costs. • Improve the quality of calibration and help regulatory compliance.